Use a mixer to beat together peanut butter, maple syrup, coconut palm sugar, and salt for the filling. Add in coconut flour slowly, until the mixture is not wet but not very dry. It should be easy to roll the balls without the mixture sticking to your hands. This will depend on your peanut butter texture how much flour to add. I used 1/4 cup of coconut flour as my peanut butter was drippy. Drop peanut butter balls into the chocolate, and use a spoon to drip the chocolate over the balls. Freeze truffles until chocolate is set. This recipe looks so tasty! I see that you have an asterisk next to the coconut flour that says see recipe notes, but there’s nothing in the recipe notes area. Is it possible to substitute regular flour for coconut flour? Sorry for the confusion! I meant to say see instructions, not notes, as you may not need quite 1/4 cup of flour. As far as the flour substitution, I don’t think regular flour would work. 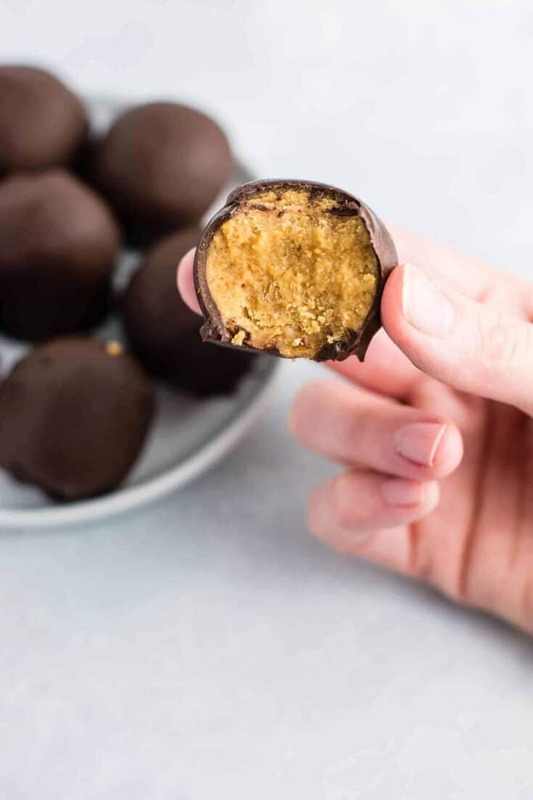 Traditional peanut butter truffles use a lot of powdered sugar, so the coconut flour is helping us replace that to make it healthier. The texture of coconut flour is very light whereas normal flour is a lot heavier. Hope that helps! Thanks that is very helpful! I was wondering the same thing. Can’t wait to try these out. I used almond flour instead of coconut flour and these came out delicious! So glad you enjoyed the recipe! I’ll have to try it with almond flour too! i followed the recipe as is and these came out so delicious! thinking of subbing the choc chips with vegan ones to make this a little less fatty. I have used vegan chocolate chips and they work well! These were delicious! I’m not really a fan of peanut butter & chocolate but these were great! I used pb w/out sugar. And I probably could have made a chocolate sauce with cocoa powder (or raw cacao powder ) mixed with melted coconut oil & maple syrup – but just used 3/4 cup normal chocolate chips with 1/4 cup butterscotch chips! Just like scotcheroos!